Jorge Masvidal was recently linked to a welterweight scrap with Nick Diaz, but unfortunately, reports of this bout proved to be inaccurate. The good news is that, fresh off a knockout of Darren Till, Masvidal says he’s willing to fight Nick’s brother Nate Diaz. Jorge Masvidal dropped this exciting tidbit during an impromptu Q&A with his fans on Twitter. “Super fight with Nate Diaz?” one fan asked. “If he’s down,” Masvidal replied. With his stupendous knockout win over Darren Till, which headlined last Saturday’s UFC London card, Jorge Masvidal rebounded from a pair of decision losses to recent title challengers Stephen “Wonderboy” Thompson and Demian Maia. These losses were preceded by a knockout victory over Donald “Cowboy” Cerrone. Nate Diaz has not fought since August of 2016, when he gave up a decision to his chief rival Conor McGregor. His lengthy absence had many fans wondering if he would ever fight again, but in November, he was booked to collide with streaking contender Dustin Poirier at UFC 230. Regrettably, this fight fell through when Poirier sustained an injury. Since then, there’s once again been question as to whether Diaz will ever fight again. Masvidal, of course, has plenty of other options. He’s now one of the top contenders in the stacked UFC welterweight division, and is hoping for a title shot — or the biggest fight available outside of a title bout. “Biggest fight out there or title shot,” he wrote when asked what he wanted next. 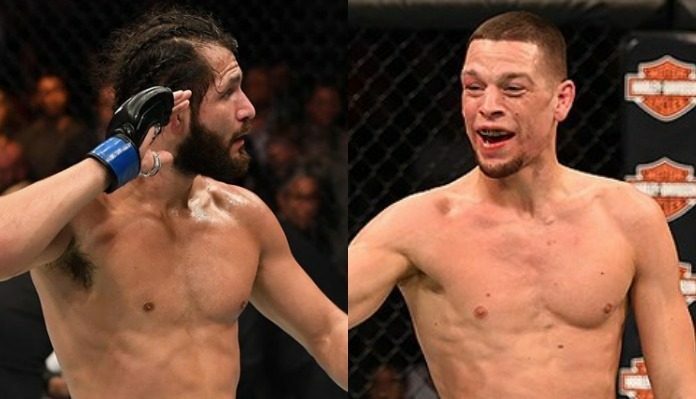 Does a fight between Nate Diaz and Jorge Masvidal interest you?